The first round of the playoffs in the World Juniors featured plenty of great rivalries and a few surprises. Quart-Finals day began with a battle of two teams looking to stay in the top tier and that series itself had a surprise participant. 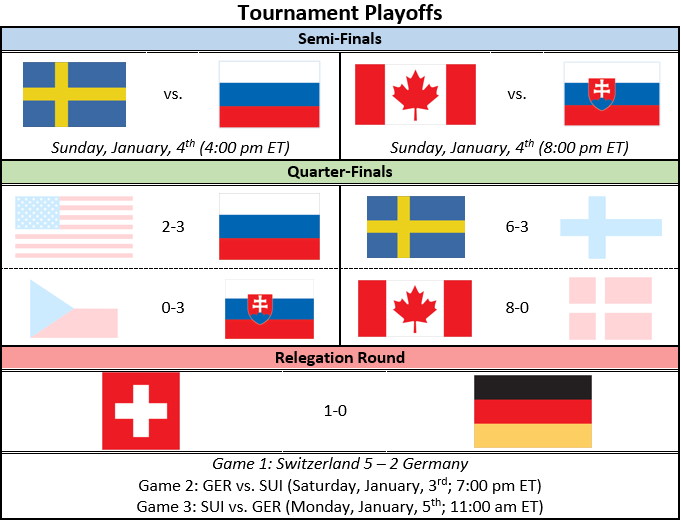 The Swiss started the tournament well enough and looked to be safe in earning a quarter-final spot while the Danes struggled. Then it all got a little muddy as the Danes won a game and the Czechs struggled leaving a three-way fight to stay out of last place. When everything was set and done the Swiss landed in last place with a date with the Germans as they tried to remain in the top tier. They took one step further to that goal beating the Germans 5-2 in Game 1 of the three game series. As they fought for their life in the tournament six other teams looked to get one step closer to the gold. To do this many teams would have to go through their biggest rivals in the quarter-finals. The only team that didn’t have that extra motivation were the host Canadians who travelled to Toronto for their first game at the ACC. Canada beat the Americans in their final round robin game and for that they would take on Denmark in the quarter-finals. There were some reports of a trap game for the Canadians but in the end they simply had the better roster. An 8-0 win sent them to the semi-final in a game that was rarely in doubt and kept the hopes for a home gold intact. Before the Canadians got their spot in the semi-finals it was a rivalry between the Czech Republic and Slovakia that determined their opponents. The Czech and Slovaks have a long history of hate and they take it all out on the ice. The Czechs have a better pedigree on the ice but this tournament had not been as good as they have been while Slovakia seemed like an improved team. That was put to the test in their matchup that began close with Slovakia getting out to a 1-0 lead in the first. Eventually they pulled away though and ended a disappointing tournament for the Czechs. The Canadians will now take on the Slovaks for the second time this year with the first game ending in an 8-0 win for Canada. It will be another game where the Canadians have to stay focused and not take their first game as proof that they will walk through a team that has been better since the opening day. The other side of the bracket saw the Americans trying to take the tougher path to the medals after losing to the Canadians in taking on their longtime rivals in everything, Russia. USA came out looking a lot less disciplined and less enthusiastic about facing Russia than when they faced the Canadians. The 16 minutes in penalties that they racked up turned out to be fatal as they fell to the Russians 3-2 with two of the Russian goals coming on power plays. The Russians are once again a strong team when it matters as their lethargic round robins are becoming habit. That play gives way to plenty of skill in the playoffs though and they will look to continue that pattern. After their win they looked to the matchup between Scandinavian countries to find their opponents. Finland and Sweden faced off in a rematch of last year’s gold medal game with the Swedes looking to get revenge after settling for silver in 2014. The Finns did not look like the team that ended at the top of the tournament while the Swedes were one of the best teams this year. The game was a close one as both teams went into the third period tied 3-3 until the Swedes went off in the third. They scored three goals in that period and pulled ahead to get a step closer to the gold. Now the Swedes take on the Russians in a rematch of one of the best games of the tournament. The last time they faced off the Swedes took the game 3-2 in a tight battle. They will look to do the same this time around and enter their second straight gold medal game. That may be easier said than done though as the Russians are a good team and are only getting better as the games get more important.